Review by AllTheBestFights.com: 2016-07-30, pretty good finish between Michel Soro and Hector Saldivia: it gets three stars. Michel Soro entered this fight with a pro record of 27-1-1 (17 knockouts) but he is not ranked as he hasn’t fought since June 20, 2015 when he defeated Emanuele Blandamura (=Soro vs Blandamura). His opponent, Hector David Saldivia (who replaces Roberto Santos), has an official boxing record of 45-3-0 (35 KOs=78%) and he entered as the No.23 super welterweight in the world. He suffered his last defeat when he faced Kell Brook in 2012 (=Brook vs Saldivia), since then he has won four bouts beating Jose Carlos Paz in 2016. 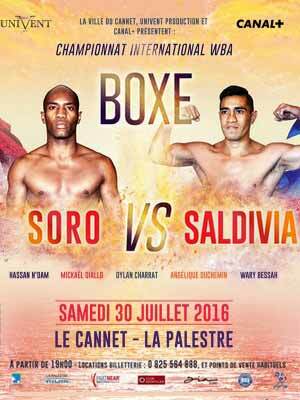 Soro vs Saldivia is valid for the vacant WBA International super welterweight title. Watch the video and rate this fight!